If you’ve recently welcomed a new kitten into your life, you’re in store for countless hours of amusement. But first, it’s important to learn how to litter train a kitten. Luckily, cats are fastidious creatures that usually learn to use a litter box quickly. While cats aren’t born with an understanding of what a litter box is or how to use it, they often pick up the skill from their mothers and start learning how to use a litter box at just three or four weeks of age. If you’ve adopted your kitten earlier than this, don’t fret. Kittens are fast learners. Below we’ve compiled a list of quick do’s and don’ts for litter training your kitten. Teach your kitten. If your kitten wasn’t trained by their mom to use the litter box, you might have to litter train your kitten yourself. Simply place your new kitten in the litter box in the morning and after meals until they get the hint. You might even have to gently direct their paw and show them how to bury evidence left in the litter box. Help your kitten feel safe. Kittens are sometimes scared of new homes, so for the first few days, litter train your kitten by creating a safe, fenced-in area where the kitten has food, water, toys and a litter box nearby. Once the kitten feels secure, move the litter box to a more permanent space and continue their litter training. Put your kitten’s litter box in a quiet and semi-private area. Kittens can be sensitive to loud noises and vibrations. When you’re litter training your kitten, place the litter box in a quiet place that doesn’t get much foot traffic. Just like you, cats like their privacy when using the bathroom. Once you see that your kitten is properly using the litter box, give them their privacy. Show your kitten where the litter box is. Especially with a new kitten, it might take a few days for them to remember where you’ve put the litter box. For this reason, be on the lookout for behavior that suggests your kitten needs to use the bathroom. In addition, put the litter box where your cat can easily find it when needed. Empty the litter box regularly. Not only will this prevent your litter box from smelling, but it is also a crucial part of learning how to litter train a kitten. Because cats are such neat freaks, they might stop using their litter box if they think it’s dirty. Scooping it out daily will help ensure your cat keeps using the litter box. Purchase the right number and size of litter boxes. The general rule for cat owners is to provide one litter box per cat. Cats often won’t use a litter box if it’s been used by another cat. In addition, if your home has more than one floor, you might need more than one litter box per cat. Also, make sure your chosen box is large enough for your cat. Even a kitten needs enough room to move around in a litter box. Keep your kitten’s litter box near his or her food. Most cats prefer to have their litter box away from their food and water dish. Once your kitten feels comfortable in your home, relocate the litter box to a quiet space. Let your cat eat the litter. Kittens sometimes let their curiosity get the best of them and will munch on their litter. While you’re litter training your kitten, keep an eye out for this. Consuming litter can cause indigestion or, worse, a blockage. Punish your kitten if they have accidents outside the litter box. Kittens are easily frightened and likely won’t know why you’re upset if you try to punish them for an accident. Instead, clean up the mess and reward them with their favorite kitten food the next time they successfully use their litter box. Ignore accidents. Your kitten might be trying to send you a message if he or she continues to have accidents outside the litter box. It could be that the litter you’re using has an offensive odor, or the litter box could be dirty. This could also be a sign that your kitten is seeking attention or feels that something has invaded his or her territory. If accidents continue, seek out advice from your vet to make sure your kitten doesn’t have a urinary tract infection. Now that you know how to litter train a kitten, are you ready to purchase a litter box and litter? If you live in Missouri, simply head to your nearest family-owned Petsway. Our knowledgeable team is always ready to help and will make sure you and your new kitten have everything you need to start your lives together. 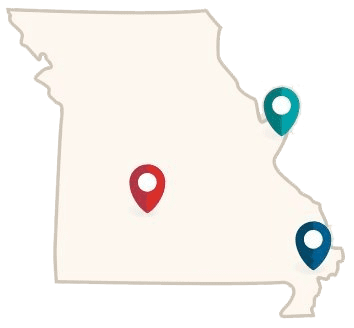 We have stores in Springfield, Nixa, St. Louis, St. Peters, and Poplar Bluff, Missouri, and we will be here for you and your pets whenever you need us.